Grooms look great in tails, but most of them refuse. They say they don't want to look like a penguin. Go to the tuxedo store with him to try on several different tuxedos. Have him try on a tail coat, just to make you happy. Explain to him that you aren't wearing the same gown as your bridesmaids, and he shouldn't wear the same as his attendants. He should stand out from them. Both of you should be dressed "special" on your wedding day, since you both are getting married. Show him how tailored the tail coats are, how slenderizing, how elegant. If you are having an informal wedding, then change his accessories to make him special. Possibly a different vest or cummerbund. If your bridal gown is ivory, make sure to order ivory shirts for the men. Take a swatch of your fabric with you to compare. If you are ordering ivory tuxedos or jackets, compare the swatch with the ivory color of the tuxedos. Be sure BOTH fathers match in tuxedos. Too often everyone forgets about the Father of the Groom, and he shows up in a suit, and looks like the "poor side". Both fathers should be in a tuxedo since they will be together in pictures, and walk the aisle for everyone to see. Traditionally weddings after 6:00 p.m. would be formal attire, but these day's anything goes! When you are ordering the tuxedos, be sure to ask for measurement cards for all of the Groom's attendants, ushers, ring bearer or page, and the fathers. Mail, or give, these to the attendants and fathers, and tell them to go to any tuxedo store for measurements, and then return them to you. All tuxedo stores will gladly measure someone, even if they are getting their tuxedo elsewhere. It is a complimentary service they all offer. Also, be sure to rent shoes for all the men. It looks better in the pictures that they all match. Set up a pick-up date for two days before the ceremony, and insist that everyone try on their tuxedo when they pick it up, before leaving the store. Nobody is perfect all the time, and they may need to make alterations, since the measurements may have been taken elsewhere. When you are at the tuxedo store, ask if they give discounts for wedding parties. 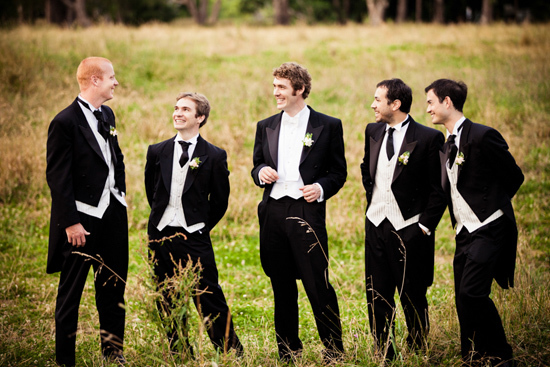 Most will give the Groom's tuxedo for free with five other rentals. Some more, some less. Sometimes you can negotiate all the shoes for free, instead of the Groom's tux rental.